My love of salads continues, and so another delicious salad is born! 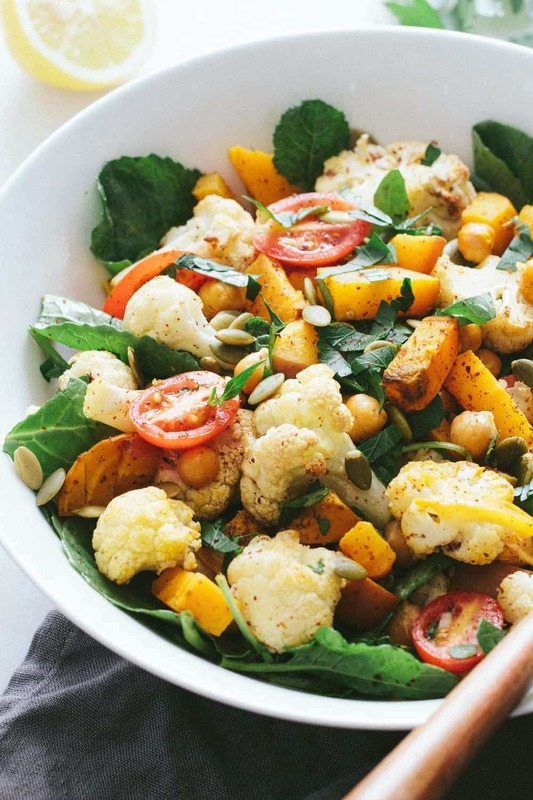 This time around we’ll be roasting cauliflower, golden beets and chickpeas, tossing them with tomatoes, baby greens, parsley and dressing it all with a lemony-sumac dressing. It’s bright and flavorful, yet simple as can be and I know you’re going to love it! This is another simple and straight forward recipe that can be changed up here and there to suit your needs. The cauliflower is a must. If you have had roasted cauliflower before, you know exactly what I mean! And if you’ve never had it, please do. It’s amazing! The beets can changed up using either red or golden. I preferred the golden here simply because it is less messy to work with. Red beets will stain the other vegetables when tossed together while cooking. For this reason, I opted for the golden beets. I also kept my cauliflower and beets as separate as possible during roasting. 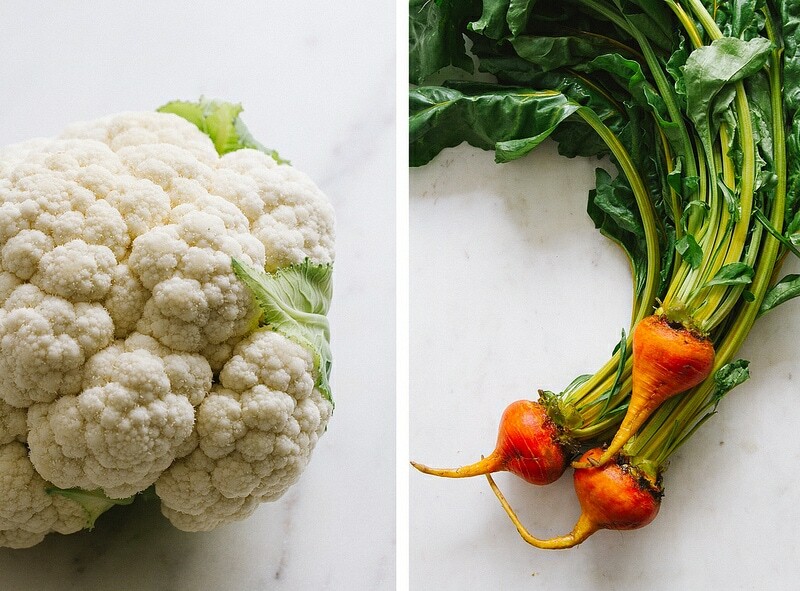 It wasn’t too hard to do and kept the color of the beets from discoloring the cauliflower. Chickpeas are the perfect bean for this recipe, adding protein and texture. The dressing is very simple, only requiring 4 ingredients, and can be prepared while the cauliflower, chickpeas and beets are roasting. 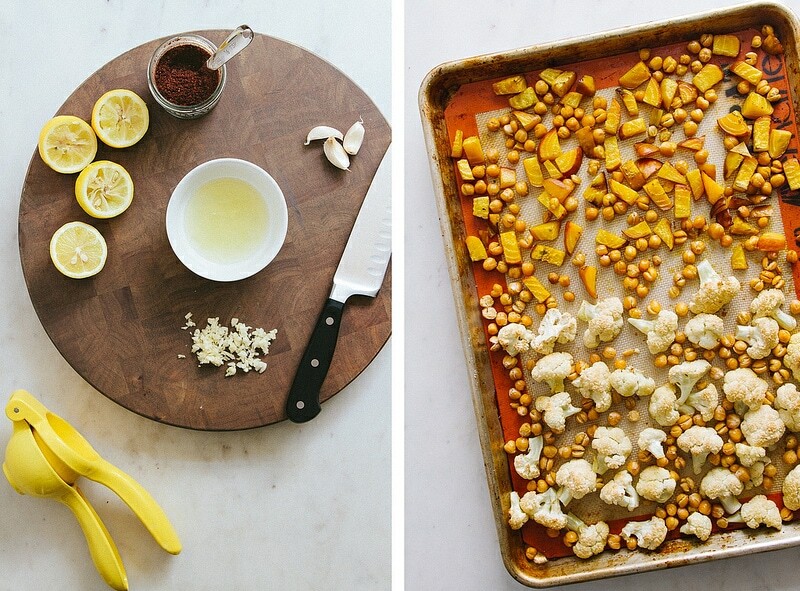 One of those 4 ingredients is sumac. This is the second time I’ve used this spice on the blog. The first was this delicious Balela Salad. You will find sumac to have a sweet, tart, citrus flavor. It’s a wonderfully flavored spice and pairs well with each ingredient in the recipe. If you don’t have sumac on hand, don’t worry, just think lemon-pepper. This salad will be just as fabulous with a simple dressing of garlic, lemon juice, red wine vinegar, salt and pepper. But, I do encourage you to try sumac if you’ve never had it. I picked up my jar from William-Sonoma, but I’m sure a quick google search will land a few other purchasing options. Once vegetables are done, add everything together and give a good toss. Add more sumac, salt and pepper to taste. A note on the greens, if using beets that have nice, healthy looking greens on top, you can use that in place of other baby greens. Alternately, use any type of baby greens you prefer such as kale, spinach, chard, or arugula. Serve in individual bowls with sliced avocado and enjoy this hearty and satisfying salad. It’s purely delicious! 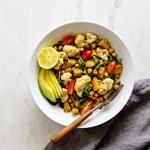 A few of my favorite things packed into one delicious and brightly flavored salad! Preheat oven to 400 degrees F. Line baking sheet with a silpat, parchment paper or lightly grease with oil. Roasting: Place the prepared cauliflower on one side of the baking sheet and the diced beets on the other. Sprinkle the chickpeas evenly over top both the cauliflower and beets. Add a small drizzle of olive oil over top, gently toss each vegetable with your fingers, making sure to keep them on their sides as much as possible. Sprinkle with a little garlic salt (or mineral salt and dash or two of garlic powder). Place baking sheet on the middle rack and roast for 40 minutes, stirring half way through. Dressing: In a small bowl, combine the lemon juice, vinegar, sumac and garlic. If not using sumac, add a few twists of fresh cracked pepper for a lemony-pepper dressing. 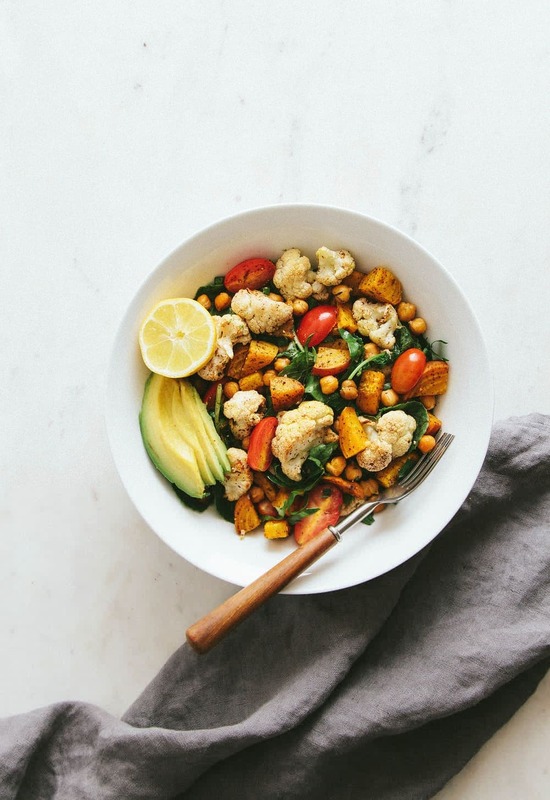 Mix together: In a large serving bowl, add the greens of choice, roasted vegetables and chickpeas, tomatoes, and parsley. Top with the dressing and give a good stir. Add salt & pepper to taste. Serve: Serve in individual bowls with a sprinkle of pepitas and sliced avocado. If beets are on the larger side, use 2. If on the smaller side, use 3. Beet greens are just as delicious and nutritious as other baby greens. Chopping them up and using them in the salad is a great way to use them! 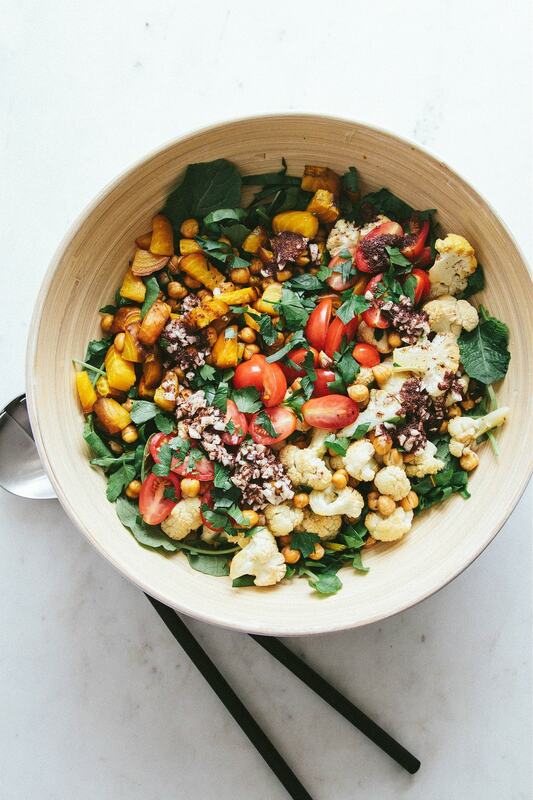 Add a grain like quinoa to make this a healthy grain bowl! I’ve been looking for another recipe that uses sumac. I cannot wait to try this!! !